I browsed through pages and pages of art prints on Visualtroop one night, as some Ira Glass podcast played in the background. At SGD 10.90 per print, these pieces of art were affordable, and definitely pleasing to the eye. Bookmarking a few in a folder called ‘To Buy When Pay Comes’, I continue through the site, a little crushed that I had exhausted every category available. My podcast ends, I click on ‘Notecards’ again — just to see the prints in card size. Visualtroop is a visual treat. Based in Singapore, it’s an online marketplace that brings artists’ works alive through everyday products. “Artists submit, we market, manage, produce on demand, ship, and artists get commission,” Jean Tan, the co-founder of Visualtroop says. 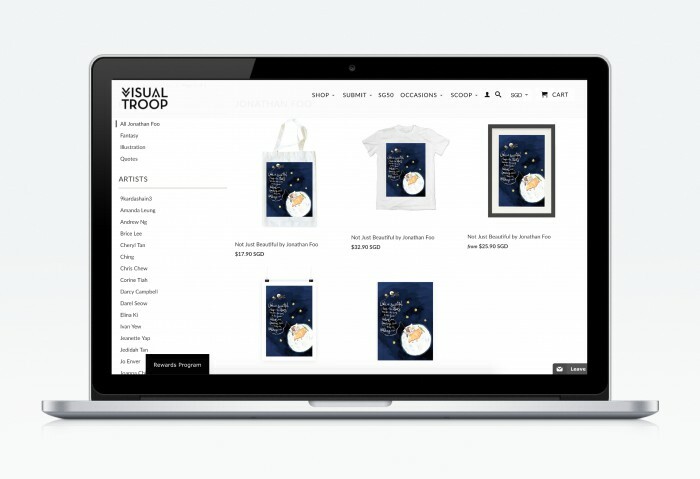 In that way, artists deal with minimal hassle in selling their work on the range of products at Visualtroop, like tote bags, t-shirts, framed prints, and more. Besides accepting artwork, Visualtroop is also open to customisation for those who want something different. Inspiration struck when Jean got the idea of printing her own designs on everyday products, but did not have the confidence to sell off all of them — as we know, it’s always a cost-saving move to print in bulk. As an undergraduate designer then, her peers reaffirmed her worries with the thought of handling sales, marketing, manual labor, and holding in-stocks — that was what got her to rope in Leonard, an alumni who was already active in the startup scene. Starting small and from scratch, the two taught themselves pretty much everything they had to know about the business — from sourcing for products to the fine intricacies of print workflow, managing and automating aspects of the site, and dealing with the business and finance work. Besides that, the team took a considerable amount of time and money to find the right supplies and machinery. At present, Jean heads Business Development, Marketing and Sales, while Leonard deals with Operations, Product and Procurement. “We started with Christmas cards last year to test the market and observe its potential — the response was wonderful,” Jean says of the first things featured at the launch of the Visualtroop site. The team soon learnt that there is “no typical day in the life of an entrepreneur — which makes it all very exciting”. They’re also pretty dependent on a bunch of apps for their productivity. “We communicate over the app Slack and do our daily updates there. This way, we know what others are working on and it helps us focus on main tasks every day. We even have our own personalised icons! One brownie point to Team Slack for implementing such a fun feature. If we have an important task/target, we hop over to Asana and create the task. It helps us keep track of our goals, which is easily buried amidst daily tasks,” Jean says. And while everyone has an important role to play, big decisions will get discussed by the team before they go ahead. It seems simple what they do: artists submit their work where it will be digitally replicated on a variety of mediums and the artist gets paid when there are sales, but there is something more that Visualtroop aims to achieve. They hope to cultivate a community that will allow artists to be recognised, and as an e-commerce platform, they also endeavour to bring the best quality products to their consumers. “There are quite some art online marketplaces around the world; some have even gone public…our focus for Visualtroop does not end in the online realm. 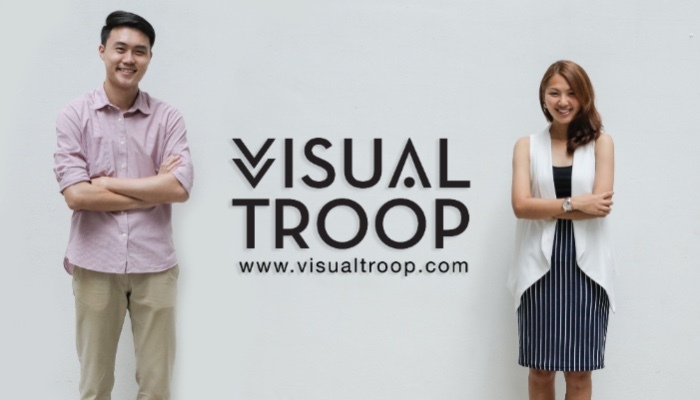 More than just commerce, Visualtroop aims to build an art community and bring recognition to artists and artworks. Yelp’s early days of community building involved holding meetups for Yelp Elites across the globe. We want to take a leaf out of their book and focus on community building, offline events and even exhibitions. We believe that’s the way to honour the community,” Jean shares. And it seems that Visualtroop are serious about bringing recognition to artists: not only do they get individual profile pages on the website, the Visualtroop Featured Artist of Week (VTFA) segment allows each of them to have a share of the limelight. 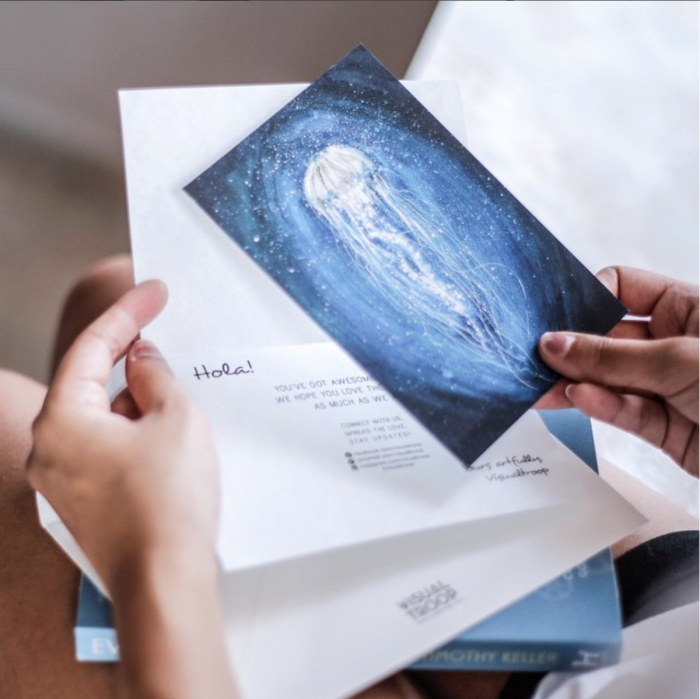 The team also collaborates with companies to promote artists and increase their exposure, and are planning to hold physical exhibitions and community meetups in the near future. With a greater appreciation of art and aesthetics in the region, it is a win-win strategy for both artists and Visualtroop. Future plans are aplenty for the lean team, but they’re also doing their part to give back to the community. Their next plan? To hold an online art forum for artists to come together for discussion and collaboration. “We envision it to be a lively, no holds barred discussion. It should also help aid designers and artists to better understand the industry,” Jean tells us. To a lot of creative people, everything is art — and Visualtroop understands this very well. If you’re looking for a space to put up your art with other creative peers, or simply seeking inspiration, Visualtroop is at your full service. So all you creative souls out there, sedia!